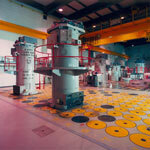 Spurred on by the lobbying of anti-nuclear campaigners, concerns over nuclear waste in the UK has divided opinion and helped stagnate development of nuclear power as part of a balanced solution to our energy needs. The reality is that the volumes of waste created per unit of energy – in comparison to fossil fuels are very low. Our unfounded concerns today are largely derived from experiences of the early nuclear power industry. Nuclear power generation does produce radioactive waste and unless dealt with properly it presents a long-term hazard to health and environment. However, the nuclear power industry safely manages all its waste and has been doing so for years. The technical problems in dealing with nuclear waste are well understood, and safe options for dealing with it have been tried and tested. The principal body set up in the UK to tackle the problem of operational and legacy waste is Radioactive Waste Management (RWM) a subsidiary of the NDA (Nuclear Decommissioning Authority). Solutions exist as demonstrated in our nuclear waste report. For nuclear waste that emits high levels of radiation but is not heat-generating, the well-established disposal route is to pack the waste into stainless steel vessels, the voids between pieces of waste being filled with specially formulated concrete. The high-level heat generating waste – i.e. spent fuel – can be recycled (reprocessed) for it’s uranium and plutonium content. In fact, the very radioactive part of the material decays quickly, and it is the less active uranium and plutonium which give rise to the “radioactive for thousands of years” quotation so often heard. However, both Uranium and Plutonium are only weakly radioactive (which is why they last so long!) and may be kept and handled in nothing better than sealed PVC bags. Indeed the Queen was handed a bag containing a sample of plutonium, in order for her feel that it was warm to the touch, when she visited Harwell. So why is nuclear waste still viewed as a major difficulty in the UK? Nuclear waste is generally categorised into three groups: High, Intermediate and Low level wastes. High level wastes (HLW) arise predominantly from spent nuclear fuel. Although the volumes are quite small, equivalent when treated to approximately one lorry load a year in the UK, this waste is highly radioactive and must be managed and stored carefully. That said, it is important to understand that radioactive materials decay, that is to say, they lose their radioactivity and become normal stable materials. For example the most radioactive fission products in the highly active waste from a reactor have a “half life” of about 30 years. Thus after 30 years only half of them remains, and after another 30 years only about one quarter. After ten half lives only about one thousandth remains. Other components are much longer-lived, but bio-absorption of alpha-emitting nuclides could be harmful so for these deep disposal has been considered. Currently, such radio-nuclides are glass encased in stainless steel and containment is easy. Intermediate level wastes (ILW) are materials that have become radioactive through irradiation or contamination. The intensity of radioactivity from these sources is not sufficient to cause significant heating, but still poses a threat to health, and needs to be contained and stored in a stable fashion. Low level wastes (LLW) are materials contaminated at very low levels. These are typically workshop or laboratory waste. For example they include hospital waste from some of the medical treatments we receive that involve the use of radiation. After treatment it still contains enough radioactivity to require storage of a kind which keeps it separate from general and household rubbish. 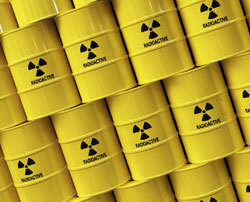 The technical processes for dealing with nuclear waste are advancing all the time. Today high level wastes are commonly converted into a glass like solid – a process called Vitrification. The result is a non-leaching, durable material in which the waste is effectively trapped. It can be stored for relatively long periods in this form – thousands of years – without concern for contamination. A more efficient method is to first treat high level nuclear waste to separate out the unused uranium and plutonium, which are then recycled for use as fuel. The remaining radioactive residue is then vitrified. It is estimated that the UK’s existing HLW if treated could provide 60 per cent of this country’s electricity until 2060. In either case the vitrified waste is then encased in sealed canisters and stored in secure facilities. In the UK this is currently above ground but the widespread international consensus amongst scientists and nuclear technologists is that such wastes should go to geological disposal, deep underground. Other options for disposal are available. One such is very deep disposal, also known as deep borehole disposal which involves the permanent sealing of waste in boreholes drilled 4 to 5 kilometres down into solid granite where they can never be of danger to us. In the UK, research into this approach is currently being conducted at the University of Sheffield. Today several European countries, including Finland and Sweden, have already established repositories at depths of between 300 and 800 metres. The vast majority of UK high-level wastes are already in Cumbria so this is the logical location for such a repository. Experts argue that this is an extremely expensive proposition and that it is sheer madness to spend £12bn on constructing a specialist-designed facility when a simple old mine and some proper education are all that is necessary. Another solution currently being researched is to smash radioactive waste material into much more stable products in a process called accelerator-driven transmutation. You would still have waste products which would need to be stored, but the resulting material would be far less hazardous. Waste Management in the Nuclear Fuel Cycle – © World Nuclear Association. Safe disposal of Nuclear Waste in the UK is policed by the Office for Nuclear Regulation (ONR), and the Environment Agency or SEPA for Scotland, according to the Radioactive Waste Management HMSO Cmnd 8607 (July 1982) and Cmd 2919 (1995).